Ang Lee’s Billy Lynn’s Long Halftime Walk, reviewed. An orchestrated attack on the viewer with a solemn message about American soldiers. 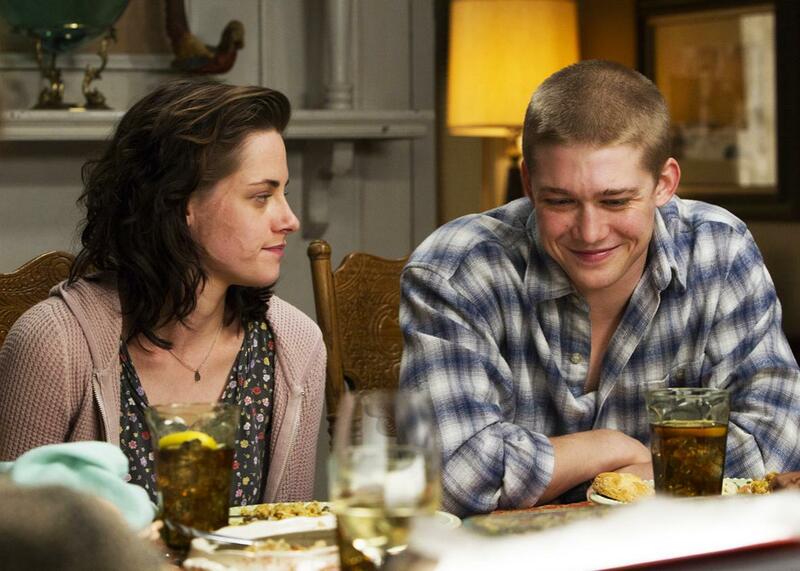 Kristen Stewart and Joe Alwyn in Billy Lynn’s Long Halftime Walk. I wasn’t able to see Billy Lynn’s Long Halftime Walk in the ultra-high-definition 3-D version being released in limited theaters. That was probably a small mercy, given that director Ang Lee’s 120-frames-per-second experiment received terrible early reviews (and that Peter Jackson’s The Hobbit, filmed at the far less assaultive frame rate of 48 fps, already struck me as a distractingly detail-crammed eyesore). Billy Lynn in its standard 2-D form isn’t particularly remarkable on a visual level, even if, as is the director’s wont, it’s handsomely composed and drenched in rich, saturated color. But the movie’s visuals, high-def or otherwise, are just one element in Lee’s orchestrated attack—and I use the word attack advisedly—on the watcher’s senses. The tight adherence to the lead character’s subjective point of view can give this movie’s viewer the sense of inhabiting a first-person video game. But rather than embodying a fake soldier in the act of killing, we’re invited to inhabit the consciousness of a real soldier who has already killed and whose struggle to live with those memories is eating away at his soul. Based on an award-winning novel of the same (cumbersome) title by Ben Fountain, Billy Lynn’s Long Halftime Walk unfolds over one day in the life of Billy (newcomer Joe Alwyn), a 19-year-old infantry soldier from Texas who becomes a media hero after his act of courage on behalf of an injured comrade—and ensuing hand-to-hand combat with an Iraqi fighter—is captured on video. Along with the rest of his Bravo unit, including hard-nosed Sgt. Dime (Garrett Hedlund), Billy is flown back to the States to take part in a halftime celebration at a Thanksgiving Day football game in Dallas. * In a structural device loosely reminiscent of Ambrose Bierce’s story “Occurrence at Owl Creek Bridge,” Billy’s memories of that violent encounter intrude, stream-of-consciousness–style, into his thoughts as the squad spends the day waiting to play their role in the spectacle. The halftime show’s producers have a poorly planned and worsly executed idea to trot out the whole of Bravo squad as patriotic props in the background of an elaborate staging of “Soldier” by Destiny’s Child. (The film is set in 2004.) “Beyoncé” herself, played by an actress’ back, appears in the halftime sequence but never speaks a word other than the lyrics of the song. This spectral incarnation of American celebrity is valuable mainly for the light she emits—a white-hot glare that, mingled with the deafening cracks and blinding flashes of a fireworks show, leaves not just Billy but the whole squad in a liminal panic state, stuck somewhere between a packed, cheering stadium in Texas and the arid Iraqi encampment where they lived the worst day of their lives. This oneiric halftime show sequence is the movie’s high point, the place where Lee’s basic strategy—to bombard the viewer with visual and aural stimuli, thus re-creating the soldiers’ jangled mental state—works best. Though no one could accuse it of being subtle, the stomach-churning excess of the halftime performance makes plain the stark irony of forcing already-traumatized soldiers to take part in an upbeat civilian re-enactment of rockets’ red glare and bombs bursting in air. America, this sequence shows, is a place sick to its very soul. The damage done to the soldiers who fight our dubiously motivated wars can’t be repaired by a few minutes in the halftime spotlight—or even by a dalliance with an earnest and nubile Dallas Cowboys cheerleader (Makenzie Leigh), who urges Billy to accept Jesus as his personal savior before offering him some more secular encouragement in a secluded corner of the stadium. Billy Lynn’s Halftime Walk mixes the book’s tone of mordant antiwar satire with scenes of raunchy horseplay and gallows humor among the members of Bravo squad. Their scenes together—many of which include Chris Tucker as a slick Hollywood agent trying to land the squad a lucrative movie deal—effectively communicate the men’s deep emotional ties to one another, even if the squad members besides Billy tend to break down into overly broad types: the even-keeled jokester, the hair-trigger picker of fights. In the Iraq flashback scenes, Vin Diesel plays a commander with a fatalistic, vaguely Buddhist philosophy who readies Billy for battle by quoting from the Bhagavad Gita. And in a present-day subplot about Billy’s personal homecoming, Kristen Stewart plays his staunchly antiwar sister, who’s racked with guilt from the knowledge that her brother’s chief reason for enlisting was to pay off her medical bills after a disfiguring accident. A few of the quieter one-on-one moments between Alwyn and Stewart—both of whom deliver exceptional performances—do crackle with something like recognizable human drama. But too many of the other dramatic scenes—especially those in which a miscast Steve Martin appears as the Cowboys’ owner, a Ted Turner–like media mogul who’s complacently oblivious to everything the squad has sacrificed—resemble staged debates between clashing value systems thinly disguised as characters. That hallucinatory halftime sequence showed us everything we needed to know about the wrenching emotional violence inflicted on the soldiers by their brief time in the corporate-sponsored spotlight. The expository hammering home of that same point in subsequent scenes only serves to weaken the impact of what came before. The Iraq-vet simulator ride that is Billy Lynn is an especially nerve-wracking experience to submit to in a time when our nation is just beginning to explore the contours of its own shell shock. Have we elected a candidate who, whether by malice or incompetence, will place an unknown number of young American men and women in harm’s way, whether abroad or at home? Are those noises we hear outside the fireworks of celebration or something more alarming?